In 2015, a car crashed into the Oklahoma State University Homecoming parade, killing three people and injuring another 22 individuals. The Coweta Chamber of Commerce Executive Director, Carrie Allamby, attended an Emergency Management seminar that outlined Stillwater’s homecoming parade tragedy. During this meeting, Carrie learned the risks that are associated with events that involve mass gatherings and became concerned about Coweta’s lack of preparedness for the annual Fall Festival. The Coweta Chamber of Commerce was among those who reevaluated their event, taking into account all potential risks. Coweta’s Fall Festival is located downtown and coincides with state highway 72. This heavily traveled road is rerouted during the festival. The festival, a 44-year-old tradition, brings in 20,000 people within 3 days. Ameristar heard about of the Fall Festival event due to bad publicity brought on by Coweta’s attempt to make changes to protect the public. Ameristar representatives met with the Chamber of Commerce and discussed measures they were taking to protect festival attendees. 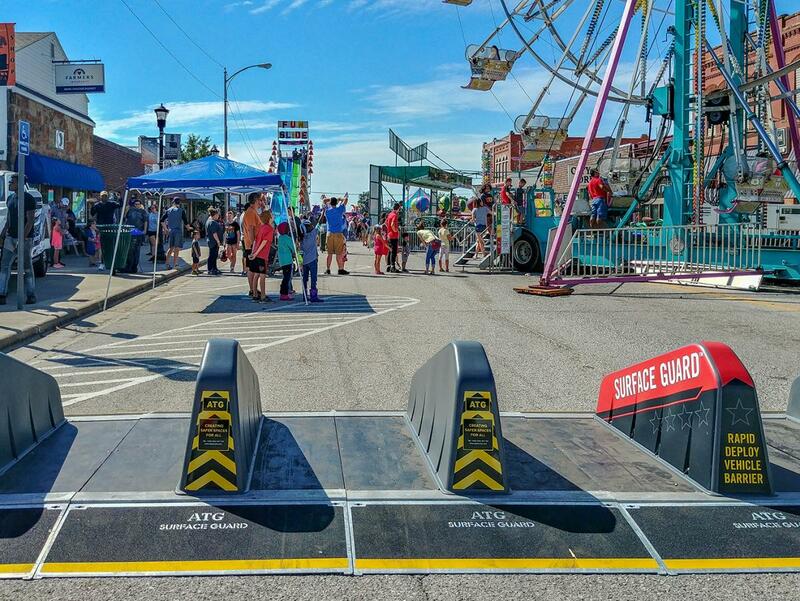 After understanding the concerns and visiting the site, Ameristar and the Chamber determined that Surface Guard, a temporary anti-ram barrier, deployed at either end of the festival was the best solution. Surface Guard is crash tested to stop a 5,500 lb. vehicle travelling at 30 MPH and a 15,000 lb. vehicle travelling at 20 MPH. Because of the festival’s highway location, crash tested security was crucial to protect against potential accidents or attacks. Surface Guard was easily deployed before the event began on September 13 and remained on site until September 15. It provided safety for event goers as they enjoyed the Fall Festival. The Coweta Chamber of Commerce was pleased with results and invited nearby towns and community leaders to view the new barriers in person. The Chamber liked that the barriers were not an eyesore and that they protected visitors from any potential risk. “Any organization who promotes a mass gathering has a responsibility to ensure the protection and safety of the people. Because society continues to evolve, the vulnerability of these events is always changing. We need companies, like Ameristar, who can provide innovative solutions to help prevent the risk of an attack,” said Carrie Allamby, Executive Director of the Coweta Chamber of Commerce.